Introduction: Locally advanced mandibular gingivobuccal sulcus (GBS) squamous cell carcinoma (SCC) has variable extent of cervical lymph node metastasis. Tumor thickness reliably predicts cervical lymph node metastases in early oral SCC, its reliability in predicting the extent of neck-node positivity in locally advanced GBS SCC is poorly studied. Objectives: The objective of this study is to study the association of extent of neck-node metastases with gross tumor thickness (GTT), preoperative histological differentiation (HD), and presence of clinical skin infiltration (CSI) in locally advanced SCC of mandibular GBS. Methodology: Biopsy-proven patients with locally advanced SCC of mandibular GBS, underwent composite resection with neck dissection from Level V to Level I, from January 2012 to February 2016 were included in this study. The intraoperative GTT was measured, the HD of primary tumor and presence of CSI were noted. Specimens were grossed as per guidelines established by the Royal College of Pathologists. The data were analyzed using SPSS version 22, Chi-square test, and Spearman's Rank correlation test. Results: In 130 patients, with gross tumor thickness >1 cm in 64 (49%) and <1 cm in 66 (51%), a statistically significant association (P = 0.0001) between the levels of neck-node positivity and HD, GTT, and presence of CSI was found. Preoperative HD showed a negative correlation whereas GTT and CSI showed a positive correlation with levels of positive node. Conclusion: Intraoperative GTT >1 cm, moderate-poor HD on biopsy, and presence of CSI were associated with extensive ipsilateral cervical lymph node metastases including Levels IV and V. These factors can help in predicting the extent of the neck dissection. 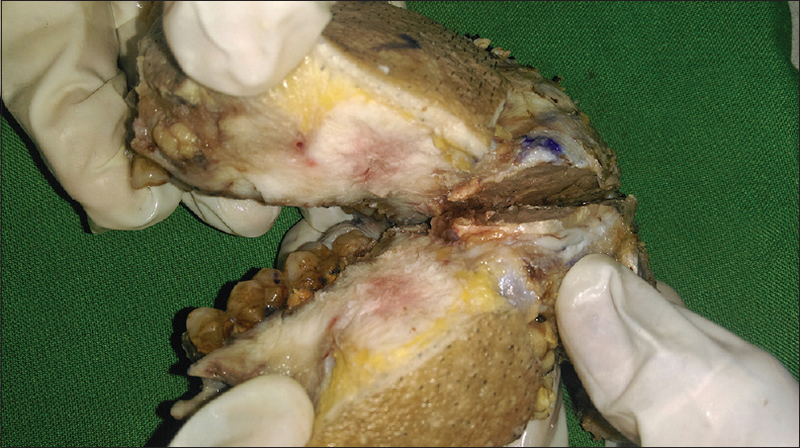 Mandibular gingivabuccal sulcus (GBS) is a common subsite of oral squamous cell carcinoma (SCC) in the Indian subcontinent, owing to high prevalence of tobacco and areca nut chewing habit. Early GBS-SCC is often asymptomatic and remains unnoticed by the patients. Most of the patients, therefore, present to a clinician in locally advanced stage. Locally advanced mandibular GBS SCC are often associated with bone and soft-tissue destruction of the maxillofacial region, cervical lymph node metastasis, and distant metastasis., This disease requires aggressive surgical management regarding extensive resection and reconstruction of the defects followed by adjuvant therapy for adequate locoregional control. As applicable to any other oral subsite of SCC, lymph node metastases is the single most important independent prognostic factor in this disease., The current evidence suggests that tumor thickness is a predominant factor in determining lymph node metastases and a tumor thickness of 4 mm in early oral cancer was strongly associated cervical lymph node metastases. Most of the current literature highlights the importance of tumor thickness and need for neck dissection in early oral cancer., However, the literature is sparse about the extent of cervical lymph node metastases in locally advanced oral cancer. This study was aimed to determine the extent of cervical lymph node metastases in locally advanced GBS-SCC and to study its association with clinicopathological factors such as demographic characteristics, intraoperative gross tumor thickness (GTT), and histological differentiation (HD) on preoperative biopsy and clinical skin infiltration (CSI). The data of 161 patients operated for biopsy-proven SCC of buccal mucosa from January 2012 to February 2016, at our centers, were analyzed. Of these patients, 130 presented with locally advanced SCC (T3/T4 tumors) as per AJCC 2009 staging guidelines, with classical extension into mandibular GBS as described by the previous studies  were included in this study. 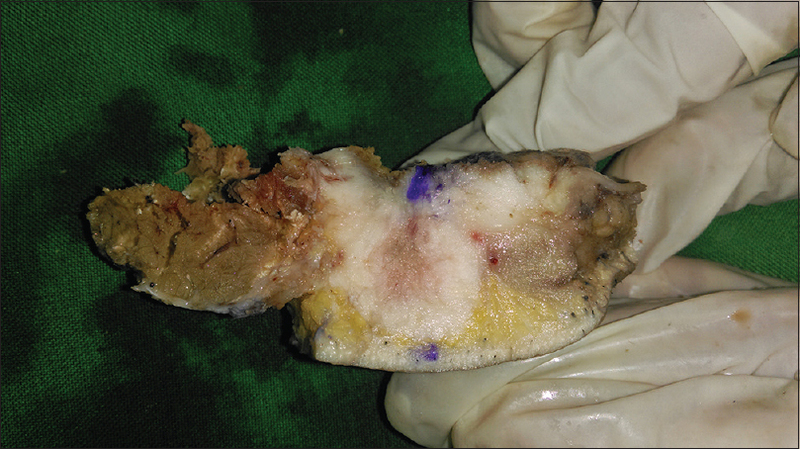 These patients underwent composite or bite composite resection with comprehensive en bloc neck dissection and clearance of Level V to Level I neck nodes on the side of the disease. The grossing of specimens was performed as per the modified standard protocol established by the Royal College of Pathologists, Standards and Datasets for reporting head and neck cancers (December 2009). The lymph nodes of each level were separated by the operating surgeon after dissecting the fibro-fatty tissue from the anatomical extent described for each level. The harvested lymph nodes from each level were transferred to labeled bottles containing 10% buffered formalin. The primary tumor was sectioned longitudinally after complete resection, and GTT was measured intraoperatively using calipers and metric scale as per the guidelines described by Huang et al., as shown in [Figure 1] and [Figure 2]. The lymph node specimens were sectioned after 48 h of formalin fixation and all the lymph nodes obtained during neck dissection were processed. The lymph nodes >2 mm in size were sectioned along the long axis, and those <2 mm were sectioned transversely. Four μm sections of the lesion and all the lymph nodes were stained by routine eosin and hematoxylin. The patient's demographic details, HD, intraoperative GTT, and CSI during grossing of the specimen were noted. The data were entered in the Microsoft Excel sheet, and statistical analysis was done using IBM SPSS software version 22 (IBM Corp. 2013, Armonk, New York, USA). Chi-square test was used to study the association between level of positive nodes and age, gender, side of lesion, HD, tumor thickness, and skin infiltration. P < 0.05 was considered statistically significant. Correlation between all the variables with levels of the positive node was assessed using Spearman's Rank correlation test. Clinicopathological characteristics of the patients in the study group are presented in [Table 1]. Among 130 patients, five patients were negative for ipsilateral neck node metastasis, on final histopathological examination. There was a statistically significant association between levels of neck-node positivity and HD of tumor on biopsy. There was a higher possibility of metastasis to Levels IV and Level V (lymph nodes of the lower jugular and posterior triangle of the neck) in moderate to poorly differentiated SCC. The association between levels of positive node and GTT was statistically significant. The tumors with gross thickness over 1 cm had a higher rate of metastasis to Levels IV and Level V. CSI was found in 47 (36%) of our patients with GTT over 1 cm. Gross CSI was found to be significantly associated with levels of positive nodes at Level IV and V. When the correlation of levels of positive nodes and other clinicopathological factors was studied, there was a negative correlation with HD of tumors and positive correlation with GTT and CSI [Table 2]. This means that as the HD shifts from well to moderate or poor, the likelihood of metastasis to Level IV and Level V increased. The correlation results showed that GTT (>1 cm) and presence of CSI had higher likelihood to involve lymph nodes at Levels IV and V in the neck. HD of tumor has been shown to be a reliable marker of prognosis in most of the malignant tumors. However, the reliability of HD in predicting the extent of neck node involvement depends on the adequacy of size of the biopsy specimen, to include the deep invasive front of the tumor. The HD may vary at the invasive front from that at the superficial areas of the tumor. Previous studies have shown that HD in larger surgical specimens has given better prognostic indications than that examined in smaller diagnostic biopsy specimens., In our own study, in 15 patients (11%), although the initial biopsy showed well differentiation, the final HD in resected specimens was found to be moderate to poor, possibly due to lack of invasive front in the biopsy specimens. We, therefore, recommend that in an event of well-differentiated tumor on biopsy, the inclusion of invasive front in the biopsy specimen should be confirmed with the pathologist examining the slide, to rely on HD as a predictor of extent of the neck nodal metastasis. If the HD at invasive front is unknown in case of a well-differentiated tumor on biopsy, the reliability of HD as a predictor of neck nodal metastasis is questionable. In this study, moderate-to-poor HD showed higher possibility of metastases to Level IV and Level V neck nodes as this represent a histologically aggressive tumor. The previous TNM staging that was used in this study (AJCC 2009) lacked the inclusion of tumor thickness and HD in staging of head-and-neck cancers. As the “T” staging of the tumor is only a two-dimensional measurement of the tumor, this has resulted in inclusion of thinner tumors with favorable prognosis in locally advanced category. In addition, due to lesser tumor thickness in five of our patients, the cervical nodes were found to be negative for metastasis. With the increasing evidence regarding the impact of tumor thickness on cervical lymph node metastases and its inclusion in the recently modified TNM classification (AJCC 8th edition. ), there is an improvement in the accuracy of disease staging and determination of prognosis. Although most of the studies have shown that microscopic tumor thickness as an accurate predictor of lymph node metastasis, we considered GTT after resection of the tumor as an intraoperative measure to predict the extent of cervical lymph node metastases, even though it is less accurate compared to microscopic tumor thickness. The measurement of GTT can be easily done with metric scale and calipers in the operating room without the need of pathologist and microscope. The results of our study were comparable with the current literature that uses microscopic tumor thickness in predicting the extent of cervical lymph node metastasis. Although intraoperative frozen section can greatly help in determining both tumor thickness and cervical lymph node positivity intraoperatively, this facility and expertise may not be widely available, and therefore, reliability of clinical parameters of a tumor becomes important in deciding the extent of cervical node dissection, especially in a patient with locally advanced SCC. As shown by the current literature the tumor thickness >1 cm had higher chances to metastasize regionally which is in concurrence of our findings. Infiltration of the skin of cheek region by SCC of mandibular GBS is clinically detected by presence of induration, fixity of overlying skin and oro-cutaneous fistula. Forty-seven patients (36%) with GTT over 1 cm showed skin infiltration and had higher possibility of extensive neck node metastasis. Previous studies have shown that skin infiltration in oral cancer was associated with poor prognosis and higher possibility of locoregional recurrence. Thicker tumors tend to infiltrate deeper into connective tissue and once they infiltrate skin there is a higher possibility of spread through subdermal lymphatic plexus into regional lymph nodes. This might have contributed to extensive ipsilateral lymph node metastases at various nodal levels. With an intent to study the reliability of HD on preoperative biopsy, intraoperative GTT and presence of CSI, in predicting the extent of cervical lymph node metastasis, we did complete Level I to Level V neck dissection in all the patients included in this study. With our findings, we recommend the completion of Level IV and Level V clearance on the ipsilateral side of the neck, if biopsy suggests moderate-to-poor HD, GTT over 1 cm, and presence of CSI. Moderate-to-poor HD on biopsy, intraoperative GTT of over 1 cm, and presence of CSI from GBS SCC are associated with higher rate of ipsilateral cervical lymph node metastasis to various levels of neck nodes, including Level IV and Level V. The clearance of these groupS of lymph nodes during surgery is essential for comprehensive management of locally advanced GBS SCC. Further studies with larger sample size are needed to validate the findings of this study. Walvekar RR, Chaukar DA, Deshpande MS, Pai PS, Chaturvedi P, Kakade A, et al. Squamous cell carcinoma of the gingivobuccal complex: Predictors of locoregional failure in stage III-IV cancers. Oral Oncol 2009;45:135-40. Noguti J, De Moura CF, De Jesus GP, Da Silva VH, Hossaka TA, Oshima CT, et al. Metastasis from oral cancer: An overview. Cancer Genomics Proteomics 2012;9:329-35. Pentenero M, Gandolfo S, Carrozzo M. Importance of tumor thickness and depth of invasion in nodal involvement and prognosis of oral squamous cell carcinoma: A review of the literature. Head Neck 2005;27:1080-91. Hubert Low TH, Gao K, Elliott M, Clark JR. Tumor classification for early oral cancer: Re-evaluate the current TNM classification. Head Neck 2015;37:223-8. D'Cruz AK, Vaish R, Kapre N, Dandekar M, Gupta S, Hawaldar R, et al. Elective versus therapeutic neck dissection in node-negative oral cancer. N Engl J Med 2015;373:521-9. Jones AS, Roland NJ, Field JK, Phillips DE. The level of cervical lymph node metastases: Their prognostic relevance and relationship with head and neck squamous carcinoma primary sites. Clin Otolaryngol Allied Sci 1994;19:63-9. Union for International Cancer Control. TNM. 7th edition; December, 2009. 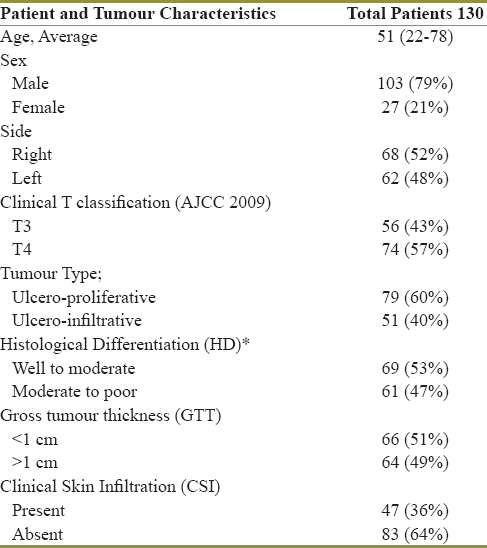 Available from: https://www.uicc.org/sites/main/files/private/TNM_Classification_of_Malignant_Tumours_Website_15%20MAy2011.pdf. [Last accessed on 2018 Aug 24]. Heliwell T, Woolgar J. Dataset for Histopathology Reporting of nodal Excisions and Neck Dissection Specimens Associated with Head and Neck Carcinomas; 7th December, 2011. Available from: http://www.rcpath.org. [Last accessed on 2016 Jan 16]. Huang SH, Hwang D, Lockwood G, Goldstein DP, O'Sullivan B. Predictive value of tumor thickness for cervical lymph-node involvement in squamous cell carcinoma of the oral cavity: A meta-analysis of reported studies. Cancer 2009;115:1489-97. Woolgar JA. Histopathological prognosticators in oral and oropharyngeal squamous cell carcinoma. Oral Oncol 2006;42:229-39. Bànkfalvi A, Piffkò J. Prognostic and predictive factors in oral cancer: The role of the invasive tumour front. J Oral Pathol Med 2000;29:291-8. Bryne M, Koppang HS, Lilleng R, Kjaerheim A. Malignancy grading of the deep invasive margins of oral squamous cell carcinomas has high prognostic value. J Pathol 1992;166:375-81. Kano S, Sakashita T, Tsushima N, Mizumachi T, Nakazono A, Suzuki T, et al. Validation of the 8th edition of the AJCC/UICC TNM staging system for tongue squamous cell carcinoma. Int J Clin Oncol 2018. Available from: https://doi.org/10.1007/s10147-018-1276-5. Mair M, Nair S, Thiagarajan SK, Agrawal J, Nair D, Chaturvedi P, et al. Skin involvement and ipsilateral nodal metastasis as a predictor of contralateral nodal metastasis in buccal mucosa cancers. Indian J Cancer 2016;53:394-6. Shah JP, Candela FC, Poddar AK. The patterns of cervical lymph node metastases from squamous carcinoma of the oral cavity. Cancer 1990;66:109-13.